The Ghana Revenue Authority (GRA) has seized about 41 packs of Special Red Grape which do not have Excise Tax Stamps affixed on them. They were seized from Kate Laryea Store at about 11:20 am during an exercise that will see the Authority visiting several depots in Accra today to check compliance with the Excise Tax Stamp policy. Head of Excise Tax Stamp Compliance Unit, Kwabena Apau told DGN Online shortly after the seizure that Excise Tax Stamps had not been affixed on the products. The products were loaded onto a GRA vehicle and taken away. 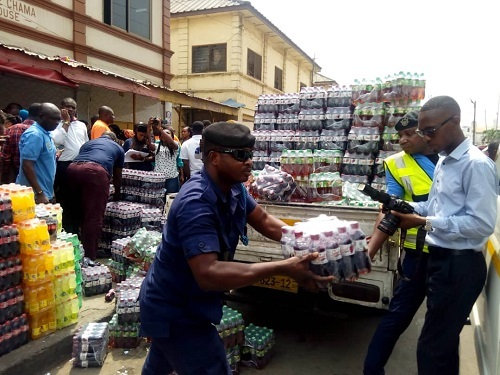 GRA is inspecting some beverage and cigarette products in Accra today, February 12, 2019 to ensure that manufacturers are complying with the Excise Tax Stamp Policy. The Excise Unit of GRA is leading the exercise. Popular brands such as Malta Guinness, Coca-Cola, among others, would be inspected at areas such Jamestown. GRA is being supported by a special taskforce comprising personnel of the Ghana Police Service and Ministry of Finance.